Over the past twenty years, the technology industry, led by companies like Microsoft, have given us powerful databases, operating systems, networks and software applications that have made it easier for us to accomplish more tasks than we did before with less people. And it’s not just Microsoft who you can blame. 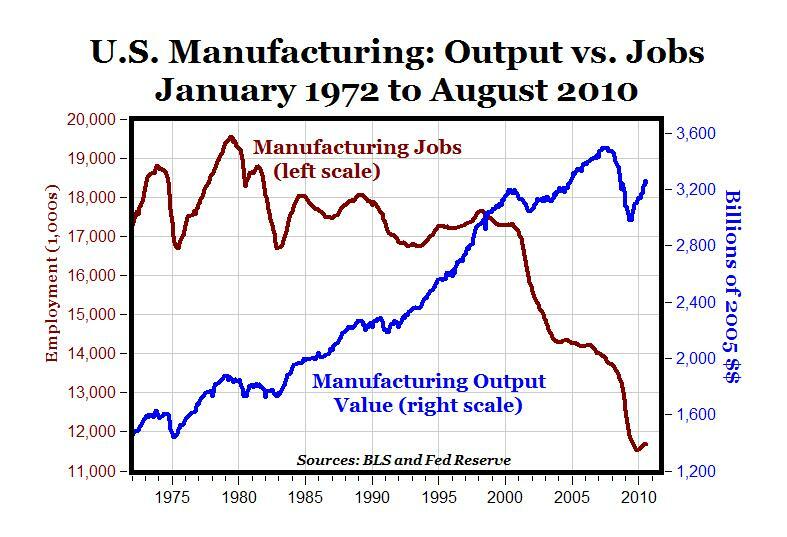 The article included the following graphic, which shows that despite a decrease in manufacturing jobs, manufacturing output has risen from 2000 until the 2008 crisis. It shouldn't be surprising that we're becoming more and more efficient, and that there are fewer unskilled job options available. 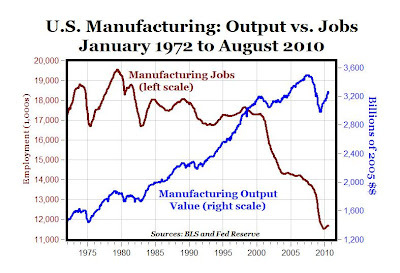 The question is, with US unemployment rate at about 8%, and 12 million americans unemployed, (and Canada only doing slightly better,) is this increased technological efficiency part of the root of our current economic situation? What if these people just aren't needed in any modern economy, healthy or not? What if we just don't need many people to work to support everyone? I have one group of friends who are complaining about the economy, and another group of friends who studied one of the STEM fields and have many competing offers for six-figure salaries right out of school. By and large the first group would balk at hearing something about executives being paid millions of dollars to lead a company to lose money, about the University of Waterloo President's $500,000 2011 salary, and heck, even about how much Facebook interns make. But what if it really is demand and supply? What if, because of technological advancement and other factors, these CEO's skills and work are more valuable than 100 or even 1000 workers? What would it do to society if a quarter of the population (plus some robots) can produce more than enough for the rest of the world to consume? What, then, would be a "fair" way to distribute income that would take advantage of this surplus?